Traverse City Window Treatments – Norman Portrait Honeycomb shades are available with a wide range of add-on features, including cordless Smartfit controls as seen within this portfolio share. Check out the top down bottom up features with no strings in the way of your view! 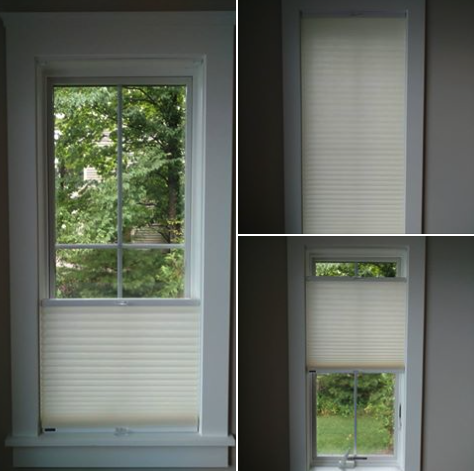 We installed these along with some Vista window film for a customer on Old Mission Peninsula in Traverse City, Michigan. Honeycomb shades are ideal for many home owners. They are the top selling window treatment throughout the Midwest for a very good reason. ENERGY SAVINGS. A double cell honeycomb shade offers energy savings all year long. Their design offers enhanced heat retention in the window months, while reducing energy transmission in the warmer months in addition to the obvious benefit of glare reduction and privacy. Our Norman Window Fashions Portrait Series Honeycomb shade selection offers all of the features you will need in a honeycomb shade. Many of the features offered in the Portrait program are proprietary, including the Smartfit and SmartRise cordless features. Child Safe certification! Motorization via remote control is also available, along with 100’s of different fabric color and opacity combinations. One of the best parts about honeycomb shades – affordability. The are one of the most cost effective window treatments available. Although Faux wood blinds will likely always be the most economical option for consumers, the return on a honeycomb investment is faster due to its more efficient energy saving benefits. If you are interested in learning more about how our window treatments can improve the comfort of your home, click HERE or give us a call today. You can contact the team at All Season Window Tinting by calling 231.943.9773 for an absolutely free, no obligation consultation and quotation on implementing our wide selection of window treatments, blinds and shades. Our service areas include Traverse City, Grand Rapids, Cadillac, Petoskey, Roscommon, Ludington Michigan and their surrounding areas.